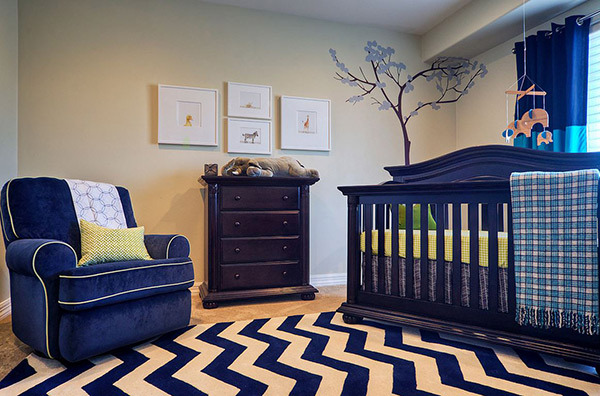 Are you trying to design a nursery for your baby boy? Are you getting overwhelmed from heap loads of ideas coming to your mind to make everything perfect when he arrives? Oh yes, that excitement of getting everything perfect on time can be delightful and stressful at the same time! I know the feeling. I am a mother of two beautiful boys and getting an impeccable design for their nursery is no easy task. You need some help to get it flawlessly done and on time for his arrival. There are a lot of beautiful interior designs out there. You need to evaluate yourself what style you like to apply to your nursery interiors. If you love the classic look then go for the traditional designs. It is predictable but in a good way. So if you are searching for a nursery with classic touch, take a look at our 20 Traditional Nursery Designs For Baby Boys. A rustic touch in this almost-all-white nursery bring a casual feel while the oversized lighting fixture and the round mirror above the dresser create depth and personality. Warm white and creamy neutral color scheme makes this room soothing and relaxing. Faux fur area rug and white glider exudes comfort as it matched with the stylish crib giving a classy and elegant appeal. 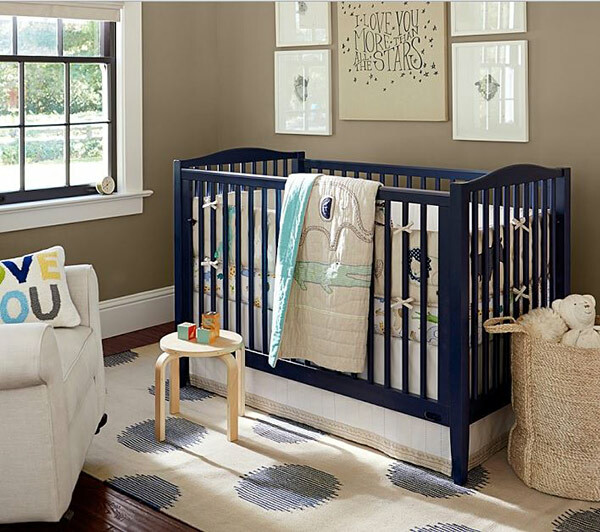 High-contrast colors bring a striking statement, like this charming crib in deep navy blue. 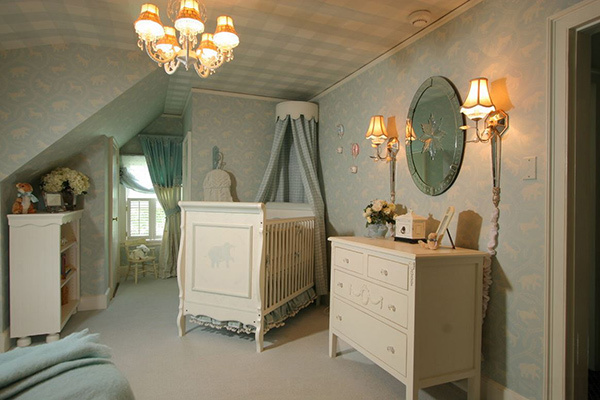 It sure does take the center stage in this traditional nursery design. Earth tone color scheme makes this spacious room welcoming and warm. Two beautiful white traditional cribs, white dresser, comfortable glider and sofa with well arranged throw pillows create a chic and cozy space. 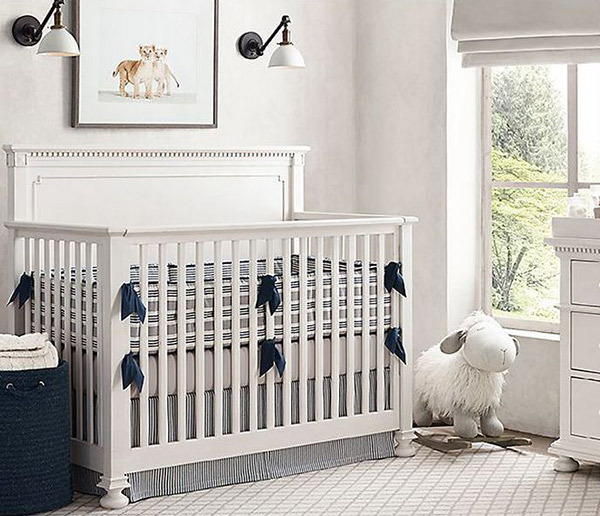 White and warm creamy palette create an inviting and serene vibe in this nursery. The hand-painted story walls bring interest while the toy-figure-theme gracing around the room keeps it playful and fun. If you love the warmth and elegance of wood then this design is for you. The classic beauty of wood paired with industrial touches seen from the light fixtures create a cozy space that is masculine yet delicate. 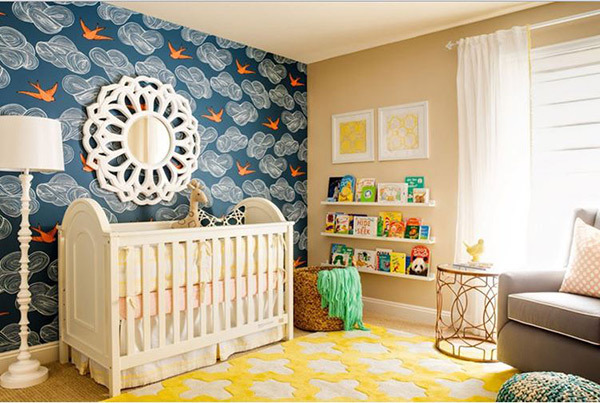 Bold patterns added to your traditional nursery design is sure to bring a sophisticated creation. The patterns and colors from the curtain to the sofa down to the geometric chevron rug are well coordinated to create one unified look. I love this nursery design! 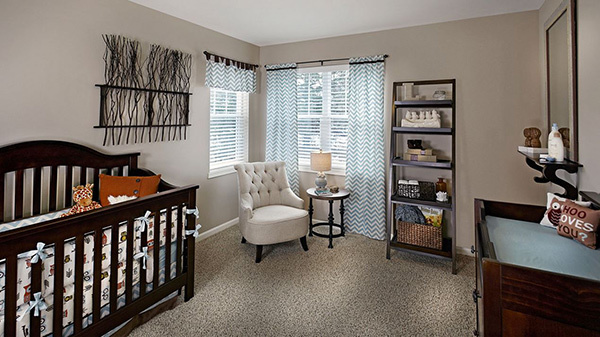 This sophisticated white and muted blue nursery blends different patterns and textures to create one dreamy space. The sconces, Venetian mirror, luxurious chandelier add elegance and classic appeal. 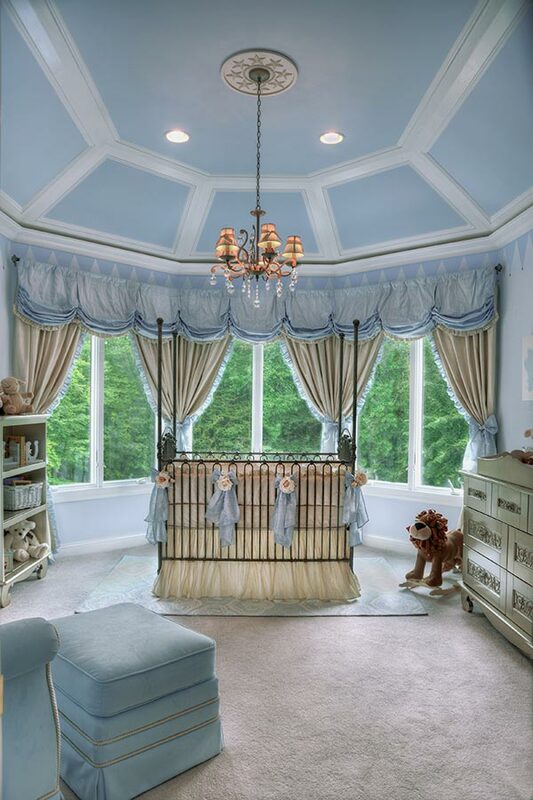 This grand nursery design is fitted for royalty. The muted colors of blue, white and cream make a soft and enchanting atmosphere that is calming and soothing. The Venetian iron crib in pewter, a fancy pewter and crystal chandelier, a Chelsea silver dresser changer all from Bratt Decor bring classic elegance and style to this regal nursery. 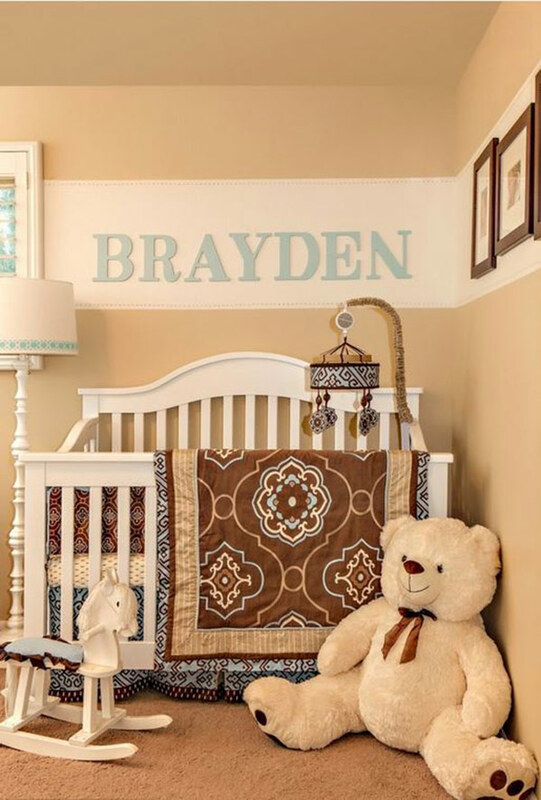 Personalized your nursery by putting your baby’s name on the wall however creative you want it to be. It will serve as a stunning statement for your nursery’s interior like the one above. Mist blue walls makes this room cool and tranquil while the layers of different patterns and textures add a refreshing and chic look. 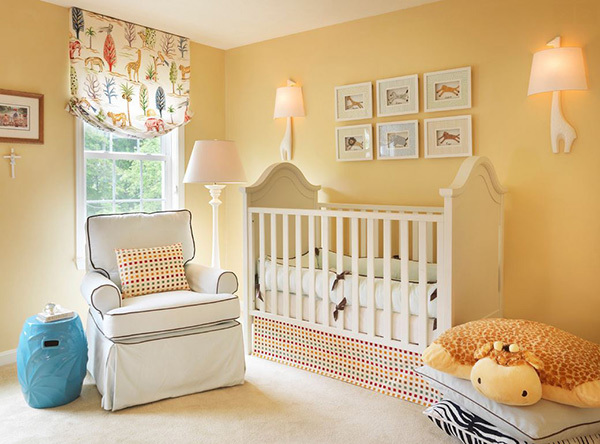 Tan walls create an instant happy mood in this nursery. The safari theme that is seen on its window treatment, framed pictures, throw pillows, giraffe sconces lend a personality to this space that is anything but boring. The fabulous four-poster-crib is sure to make your little prince sleep in style. The muted colors of blue and white with all its soft and delicate textures and patterns bring a charming sanctuary that is sophisticated and elegant. Bold mural of flying birds and clouds makes a perfect canvas for a white traditional crib which is the focal point of this room. The geometrical patterns on the rug, side table and pop of vivid colors make this room fun and inviting. Cool bluish-gray tone when paired with warm creamy palette creates a welcoming and refreshing space. Take advantage of a spacious wall for a reading nook. Matched it with an overstuffed glider for a stylish and comfortable reading area for you and your little one. To top it all up use a muted turquoise hue accentuated with green decors to exude a contemporary appeal. Neutral palette is naturally inviting and when paired with warm deep wooden tone it creates a high contrast effect that is soothing and stylish. 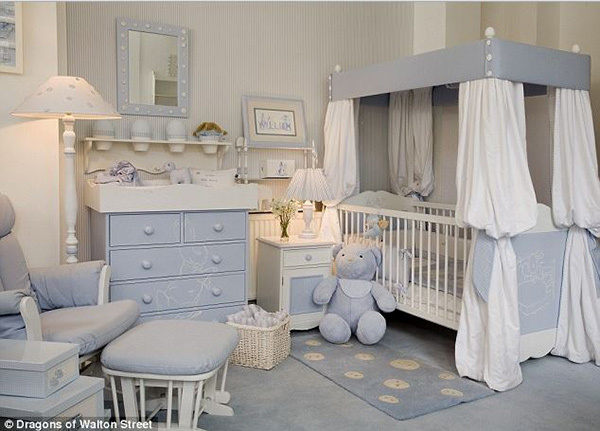 Crisp white accentuated with deep blue tone creates an interest to this heaven-like nursery. 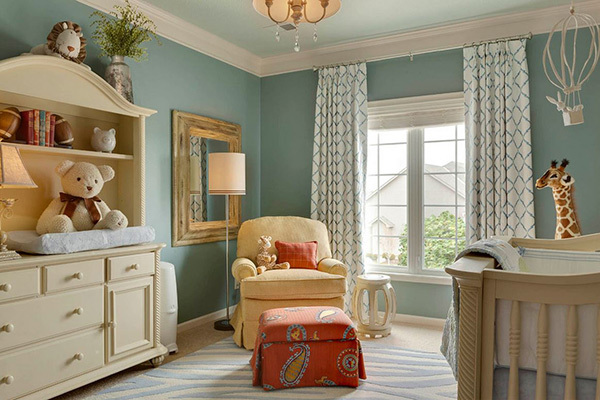 Gray and blue color scheme is an exquisite choice for a baby boy’s nursery. It brings elegance and class as it is soothing and restful. 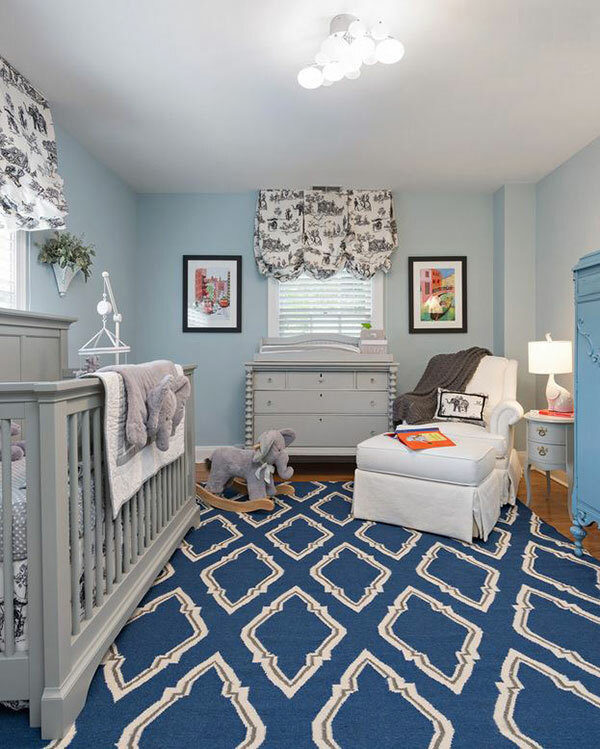 The blue and white area rug with its bold patterns is a big style statement in this serene nursery. 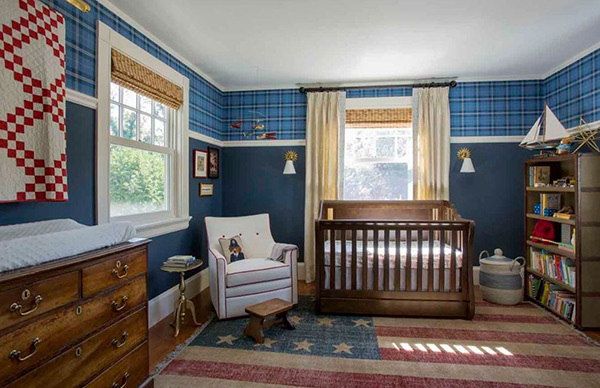 The combination of different patterns, textures, red, blue and wood finish bring a casual feel to this all-Americana-Ralph Lauren-inspired nursery. The happiness in creating the most peaceful and comfortable room for your little one is inexplicable. The excitement of anticipation makes you naturally creative. It is what drives you in getting really picky when decorating your baby’s sweet retreat. Oh how wonderful it is to channel all that excitement and joy in designing your baby’s nursery! The careful and original touches that you can bring to that space will make it more personal and comfortable for you and your little darling. So do not stress yourself out, and just enjoy every minute you spend in designing your baby’s nursery. The happier you are, the better the result you can get. Hi Lynn, Its my 1st visit to your blog but after reading your stuff I realized you have great interior design skills. in particular this blog perfect I loved the above designs for baby boys. Keep up the good work!! Hmmm … looks like a great way to get started instilling gender-based stereotypes right from the get-go. What do any of these ideas have to do with “boys” and not “girls”?